Q. How long will it take for Magnet Therapy to have an effect? A. Some people experience positive results within a few days. Others will only start to feel changes after two or three weeks. This is a very individual matter and is dependent upon many factors including the type of complaint and how long it has been suffered. Usually the first indication of Magnet Therapy working is an increase in energy level and/or a general sense of wellbeing. Q. Are there any side effects of Magnet Therapy? A. ln rare cases individuals have experienced slight nausea which was immediately solved by wearing the bangle during the daytime only. However, the improvements to these people’s ailments, were happening despite this. Q. Why am I not noticing any difference? A. People have found with Magnet Therapy that it is important to drink enough water. lt is recommended anyway to drink two litres per day. Magnet Therapy does not work on an occasional basis. lf you are not normally wearing your magnets, you cannot expect results. If you are fit, energetic and do not have any ailments, you may not notice any significant effects. As your regular mineral and vitamin intake tends to ward off illnesses, it may be helpful to wear magnets in a preventative role. Sufferers from serious conditions should always seek professional medical advice. Q. Do I have to wear the magnets continuously? A. You can wear your magnets day and night (some people never take their jewellery off) or you can choose to wear your magnetic jewellery during the day only. Magnet therapy is a natural therapy to which individuals react in varying ways. Just try and see what works best for you! Make sure you remove your jewellery however during a shower or swimming as emerging in water will void the warranty. Q. How long will the magnets last? Q. How do I best put a copper bangle on my wrist? A. To fit a copper bangle, first open it slightly. (Pull it open holding it near the ends so both sides open evenly and it stays in shape.) Then slide over the narrowest point of the wrist so the opening is at one side. Turn through 90 degrees so the opening is at the back and gently squeeze the bracelet back into shape so that it fits your wrist comfortably and feels similar to wearing a watch. Q. Does the bangle have to touch the skin? A. No. You can wear your magnetic jewellery loosely around your wrist. 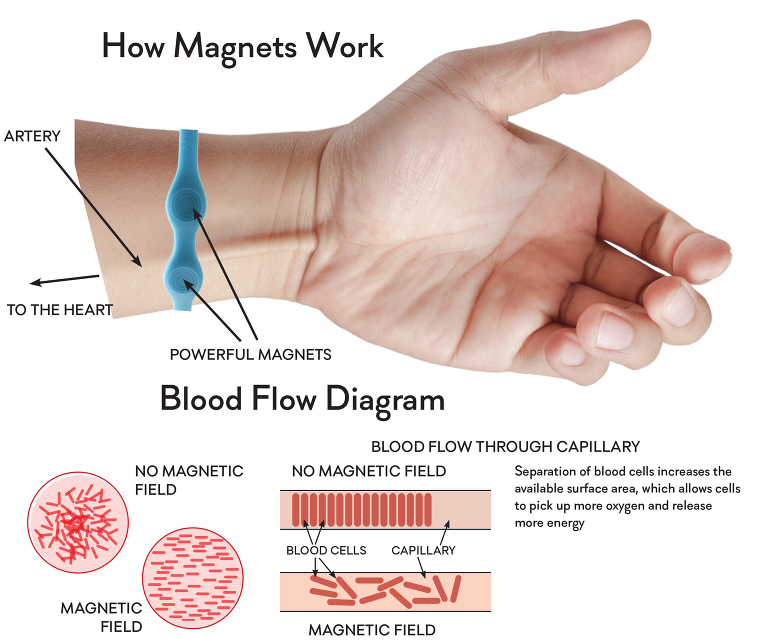 Magnets are strong enough to have an influence on the blood circulation several millimetres away from the skin. Q. Does the magnetic product have to be on the pulse point? Q. Can I wear my bangle on the same wrist as my watch? A. Yes. A magnet may only make your wristwatch stop temporarily if you place a magnet exactly over the very small area of your battery. As soon as the magnet is removed the watch starts working again. You can safely wear a bangle or well-fitted bracelet next to your watch. Q. Will my wrist turn green when wearing a copper-magnetic bracelet? A. With some people the bracelet can discolour their wrist due to a natural reaction between the acidity of their skin and the copper. This is a good sign and is an indication that the body’s perspiration is reacting with the copper from the underside of the bracelet. Some compounds of the copper are then absorbed through the skin into the blood stream. Copper has anti-inflammatory properties that are helpful to people who suffer from arthritis and rheumatism. Green marks can simply be washed off with warm water and soap. Of course many MaxxWell Australia products are not copper as some people neither want nor need the benefits of copper. Q. How strong are the magnets in MaxxWell Australia products? A. They are normally 1200 Gauss per magnet (unless otherwise stated) with the north polarity facing towards the body. Gauss is a measure of the number of lines of magnetic strength which cross a square centimetre. Clinicaltests in Japan have shown that 500 Gauss is the minimum to have significant effects. Experience has also been that too high a strength (i.e. 2000+ gauss) can sometimes cause trembling sensations. Q. Which wrist should I wear my magnetic bangle on? A. Since the blood flow is similarly strong through both wrists, there should not be a difference. However, it is well worth experimenting, since in oriental medical understanding the body is asymmetrical! Q. How is it that wearing a magnetic bangle on my wrist can help my bad knee? A. As it is understood that the primary effect of magnets is on the condition of the blood circulation, it is reasonable that any part of the body can be helped by this improvement. Oxygen and nutrients being carried to all cells in the body, and toxins taken away more efficiently, enable the body to heal itself to a surprising extent. It is rather the same as putting an aspirin in your stomach to take a headache away! It may, however, be more beneficial sometimes to apply magnets locally to a problem area in the form of magnetically charged wraps. Q. What is the meaning of regulatory therapy? A. This means a therapy which has a controlling effect on a condition. For instance, with high and low blood pressure, Magnet Therapy can give improvements to either condition. If you are under medication you should always seek professional advice regarding any treatment. Q. Are there scientific studies on magnetic therapy? A. The properties of magnetite have been known and used in medical therapy since ancient times (1). These days static magnets are employed for a great number of different clinical pictures; in particular for disorders of the locomotor system (2-5,7) and in neurology (6), to reduce the after-effects of cosmetic surgery – they enhance the wound-healing process and reduce or even prevent unsightly scarring (9). The efficacy of magnets probably depends on their magnetic strength and on which polarity faces the skin (10). MaxxWell Australia magnets have a surface magnetic strength of approximately 1200 gauss and are worn with the north (1.e., the negative) pole facing the skin. 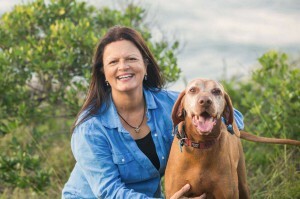 The most important physiopathological mechanisms to explain the efficacy of magnetic therapy are improved microcirculation (improved blood flow in the very small blood vessels) (10) and an anti-inflammatory effect – magnetic power can promote the release of cortisol, an anti-inflammatory agent. An anti-inflammatory effect is also often accompanied by pain relief (11, 12): magnetic power can inhibit the flow of energy in the pain channels, significantly reducing pain perception in the brain (13-16), and influences the central nervous system (17). Magnet Therapy does not appear to have any particular side effects and doses of pain-relieving drugs can often be reduced when Magnetic Therapy is used (9). NOTE: Please do not wear magnets if fitted with a pacemaker, or other AIMD (Active Implantable Medical Device), and/or during pregnancy.